This was BEAST MODE vs SKETCH MODE at the most extreme...frigid temps (record low high for Seattle! ), crushing crowds and constant body jams (700,000 people!) and a sketcher's logistic nightmare. I stood for hours like a sardine with a mechanical pencil in my inside breast pocket which I could barely reach, and a 3.5x5.5 Moleskine in my other pocket which I could barely reach. 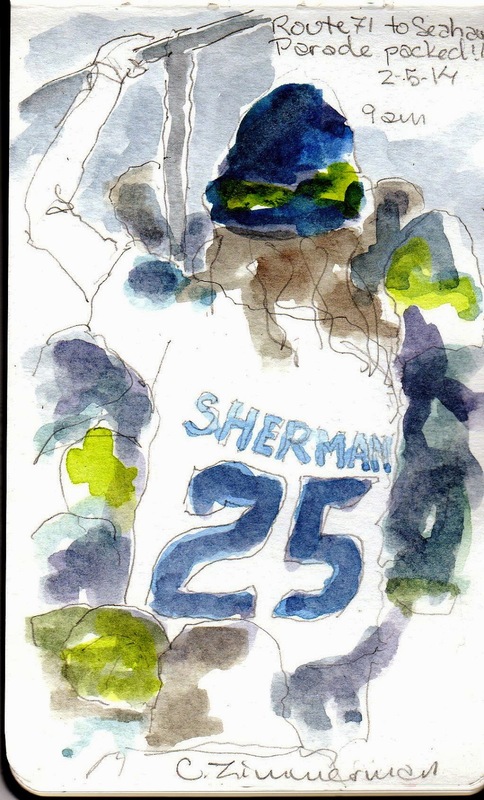 This sketch was a "SHOUT OUT" to the Seahawk Super Bowl win as well as to Stephanie Bower for her Good Bones workshop I attended last weekend. (Stephanie, I truly was looking for my eye level horizon line, but I'm so short.) I stood at least a dozen people back from the barricade at 4th and Pine. If I jumped up repeatedly, I could glimpse a Duck boat and some of the team members riding by. I was constantly jammed by elbows and bodies. I chose to sketch this exhilarated cheerleader who managed to climb up on the pedestrian crosswalk sign and shake her pompoms to the rocking music at Westlake Mall while waiting for the parade to start. The bus commute to downtown provided some sketch opportunities. This was the start of Route 71 from Wedgwood to downtown done at 8:55am. 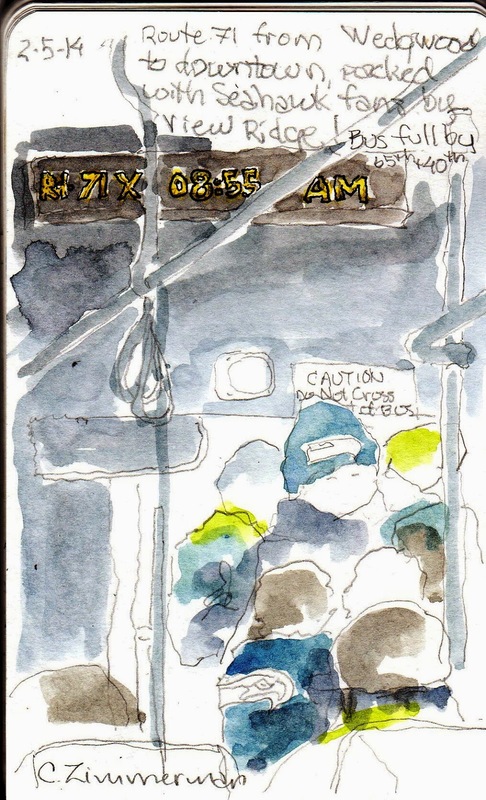 By 9am after driving ten blocks, the bus was full and no more riders were allowed to board. All watercolor splash done later. Not my best artistic sketches, but definitely sketches that captured a memory I will always have! Really nice sketches, Carleen. Really like the foreground transitioning to background. Looks like such a fun day ... despite the cold. I caught glimpses on my IPhone, but the sketches really give me a feel for the event. Way to go. Thank you, Jane. I wished I could have calmed down enough to really choose a better composition. I also prefer ink over pencil but was afraid of losing the cap to my Uniball in this crowd.